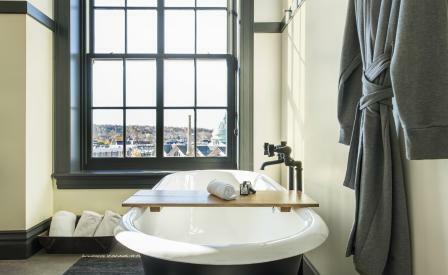 The Ace Hotel’s long-awaited Pittsburgh property has finally opened its doors in the storied city’s East Liberty neighbourhood. Sited within in a hundred year old, former YMCA building, the group’s nostalgia-tinged model couldn’t have found a more appropriate home. Armed with 63 rooms spread over five storeys, the hotel exhibits a palpable charm that draws from its surrounding community of shops, galleries and cafés. Designed by Atelier Ace, much of the original brick structure has remained untouched, including its three-floor gym, which pays homage to the city’s sports-oriented culture. In the rooms, regional Pennsylvanian craft is showcased alongside found vintage pieces. Zak Kruszynski of local design studio Bones and All, is responsible for the furniture pieces in the gym and the bar and also created each of the guest room’s luggage rests that double as both storage and seating. As always with the Ace, there’s plenty of food for thought too. Brent Young, Pittsburgh native and founder of Brooklyn’s famed butcher Meat Hook, has curated the hotel’s culinary delights.